Was it a lateral? It was the Wild Card game and the Buffalo Bills had just marched down the field for a field goal. The kickoff was just a formality, but the Tennessee Titans pulled out a playground return, including a lateral that totally looked like a forward pass because of where the players were standing, but on closer inspection proved to be legit. What a play. What a way to end a playoff game. There are no flags on the field. 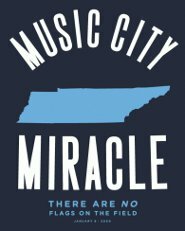 If you want to reminisce about the great Titans win on January 8, 2000 over and over again because perhaps it was one of the greatest days of your life, then this Music City Miracle T Shirt is yours for the taking. Of course, if that was one of the greatest days of your life then you probably have to question what you’ve done with your life, just a little bit. Because, really, it’s a bunch of wealthy dudes you don’t even know out there, throwing and kicking and running with a ball. I’m assuming you were not actually part of the organization at the time. If you were employed by the Tennessee Titans in January 2000, then I’m giving you permission to call that one of the greatest days of your life. Otherwise, it was just a good day for you. 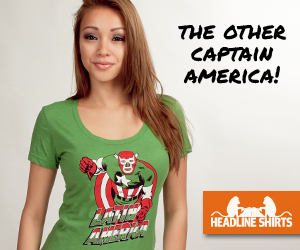 Either way, you should probably pick up the shirt from Busted Tees.